Time for something different … a review. I’ve been following the work of Andoni Canela since discovering his book ‘The Cantabrian Bear’ (El Oso Cantábrico), whilst we were visiting the region of Somiedo in Asturias, 3 or 4 years ago. 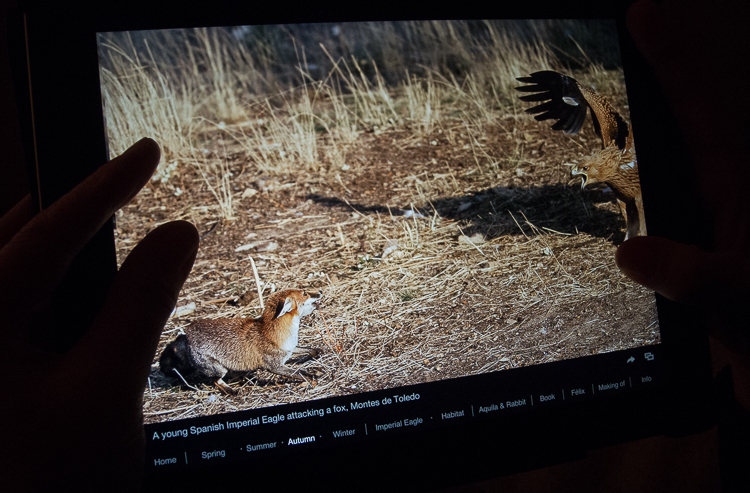 Andoni has now produced an App for the iPad to accompany a hardcover book about Spanish Imperial Eagle. It’s a 2 year project dedicated to telling the story of one of the most endangered eagle species in the world. The main section of the ‘Aquila’ App is neatly divided into the 4 seasons displaying a multitude of different photos – shots at the nest, in flight, hunting and behaviour. There’s also further sections explaining general ecology of the Imperial eagle and it’s habitat within the Iberian Peninsular. The App contains over 200 photos, with additional information panels, notes and an interactive story for children. Also used to great effect, are sound clips accompanying many of the photos (eagle’s calling and local sounds to its surrounding environment etc.). The personal photographic journey shines through when reading. 50 short ‘making of’ video clips shattered throughout the App to help provide the back story to towards the final shot. These include moments recorded during the many hours spent waiting in his hide. One notable clip is with the hide and camera equipment is hanging by rope tied to a tree, high up on a cliff edge, in the soaring heat of Sierra de Andujar in Sierra Morena. The quality of the photos uncovering the lives of this rare eagle do not disappoint. Above is the Imperial Eagle captured swooping down upon a fox and is one of many moments. Another highlight for me (among many) is a shot of a young eagle drinking from a pool at Montes de Toledo. Truly magical. But beyond the amazing images, there is a strong sense of adventure and exploration in his pictures. They show the fragility of the Imperial Eagle population and more importantly present the conservation message. I guess these are expeditions we all dream of undertaking. To embark on a grand project. But without the time, skills and expert knowledge, we can at least live vicariously through others work. And of course without the 100’s of hours waiting! There are of course, no Imperial Eagles in Asturias but partly inspired by looking through this App, we recently made an excursion to Monfragüe and we were lucky to see a Spanish Imperial Eagle for the first time and on several occasions. I now a have a renewed urge to leave the borders of Asturias and discover these other new places, Sierra Morena, Donaña, Sierra de San Pedro & Montes de Toledo …. the home of the Imperial Eagle. Despite my love of looking through wildlife photography books, this new form of presentation is very appealing and the main reason I bought an iPad. Aquila – 2 years flying with Imperial Eagles – recommended. Available at the iTunes Store – click here. At the time of writing it’s only £2.49 or 3.59 euros.